One of my ’17 season objectives was to give some national champs races a go. The National Circuit Champs seemed a good opportunity, considering the races are spilt across age groups and I can hold my own in a sprint. Oulton Park motor racing circuit was the venue, following the usual criterium format of 1 hours racing, with a lap board counting down the last 5 laps. The course was about 1.7mile long, undulating, with chicane on the lower section followed by a rise to the start / finish line. The early rain had passed with surface conditions good, but a strong head wind prevailed on the top part of the loop. More than 70 riders from around the country signed on for my race, following a warm up in the carpark we entered the track via the pits, following a lead car which soon disappeared into the distance leaving us to race. I ‘clocked’ a few familiar strong riders and committed to stay at the front of the bunch to get involved in any early breaks, sure enough within a few laps I was in a break of 6 riders but we only had a few seconds on the bunch, we dangled off the front for about 3 laps until extra recruits bridged across to us, forming a larger group of 10, this was what we needed to put a decent gap on the main peloton due to the strong wind. We pushed the pace, working well together and dropped a couple of our group prior to the 5 lap countdown. Just before 3 laps to go one of our group put in a big effort to break away, I chased on and looked around to see that a further selection had been made, down to 6 riders. The last lap bell sounded and started to eye each other up, no one wanting to lead each other out, I cruised to the front prior to the downhill section, negotiated the chicane for the last time and awaited the first attack up the rise, 2 riders jumped early and I had to sprint to latch on to their wheels taking a position as far to the right as possible to shelter from the cross-head wind, the full sprint now opened up, a good 300 meters from the line, I had to go…. I got my head down and came past into the lead a bit too early, I had no choice other than to dig deep and hold my sprint telling myself not to look around, relying on peripheral vision, I crossed the line – OMG I’ve won! I claimed the red, white and blue national jersey and medal on the podium; the winner’s red wine went down well later on. Many thanks to TLI Cycling organisation, Graham Weigh, Steve Cowley and their team of helpers for making the day such a great success! 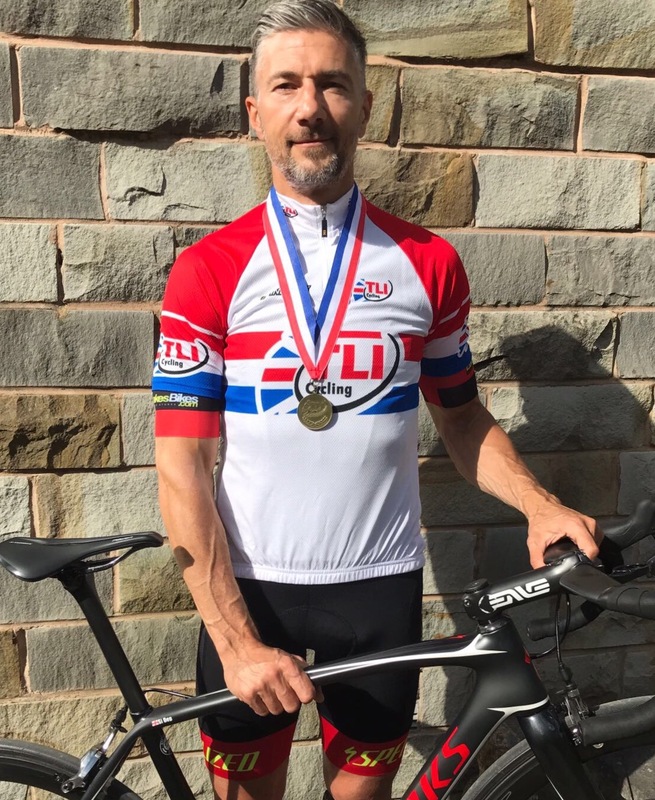 This entry was posted in Results and Reports and tagged National Champion, Simon Deplitch, TLI, TLI National Championships. Bookmark the permalink.